Lafayette County, Missouri; 1901. From Fiegenbaum-Gerber family; all rights reserved. 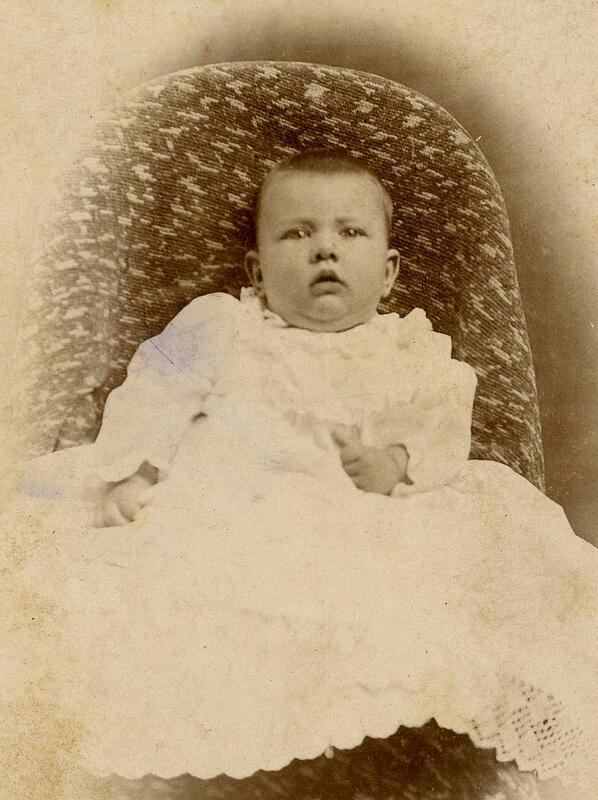 John Henry Fiegenbaum at the age of 3 months. Lafayette County, Missouri. From Fiegenbaum-Gerber family; all rights reserved. "This is long past being fun. May I go now, please?" Miami, Oklahoma; 1925-1926. From Fiegenbaum-Gerber family; all rights reserved. 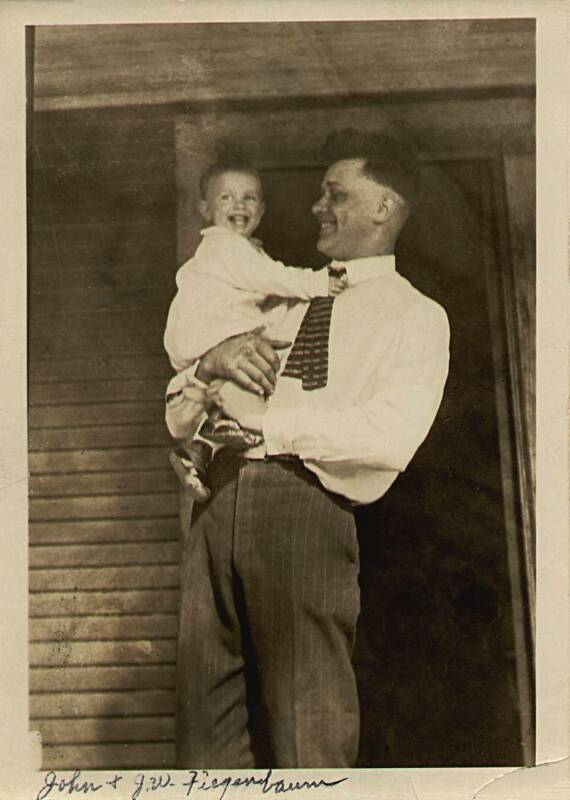 John Henry Fiegenbaum and his first child, J. W. Fiegenbaum, enjoy a happy moment. Dad is a hard working man; notice his banged up knuckles. 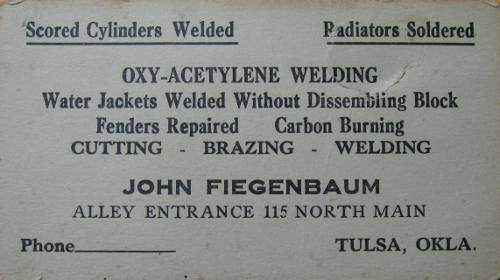 Early in his married life, John worked as an auto mechanic at Tulsa, Oklahoma, where J. W. was born, and at Miami, Oklahoma, where Dorothy Lorraine, his second child and only daughter, was born. By 1930, the family had return to Lafayette County, Missouri, where John and his wife, Katherine Margarete Maun had been born and married. John resumed farming, an occupation he practiced for the rest of his life. The dark clapboard siding in the background would suggest that the photo was taken at the family home in Miami, Oklahoma. Many decades later, J. W. recalled that the family had lived at 200 South Main. Tulsa, Oklahoma; c.1924-1925? From Fiegenbaum-Gerber family; all rights reserved. 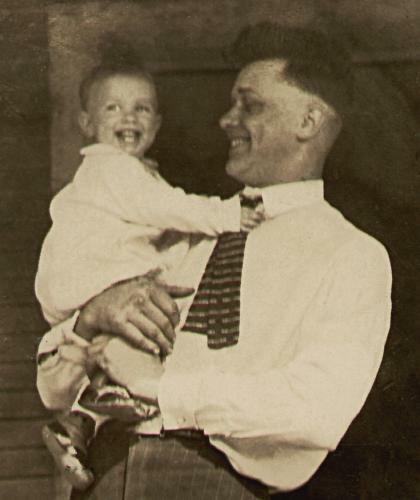 Miami, Oklahoma; c.1926-1927. From Fiegenbaum-Gerber family; all rights reserved. This photo shows the interior of L & L Auto Supply, in Miami, Oklahoma. John Fiegenbaum is the tall man in the center. 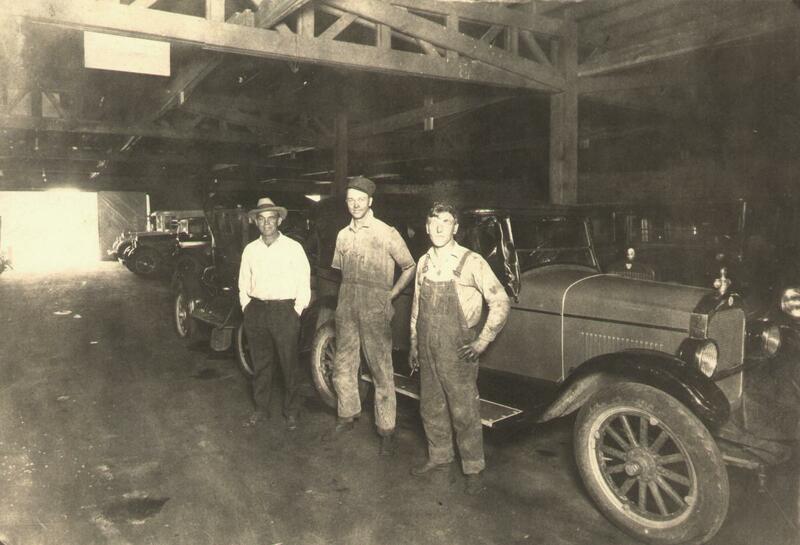 The man on the right may be John Linton. I don't think he works he in the shop; his white shirt is much too clean. 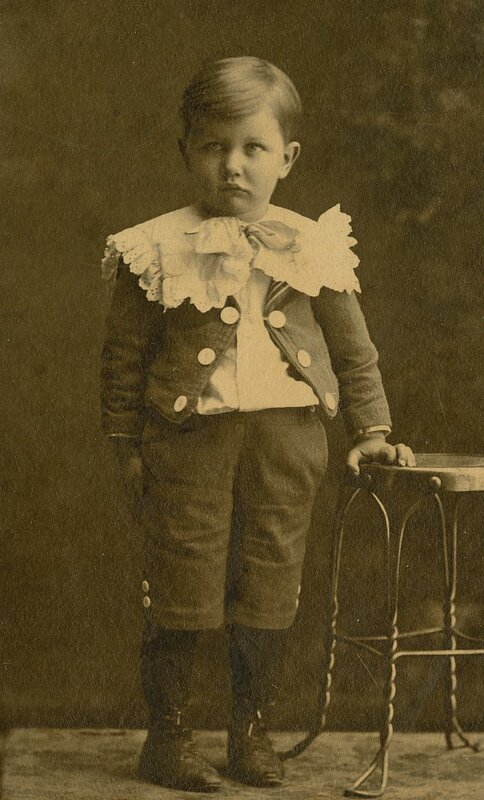 The other gentleman, wearing bib overalls, has not been identified. 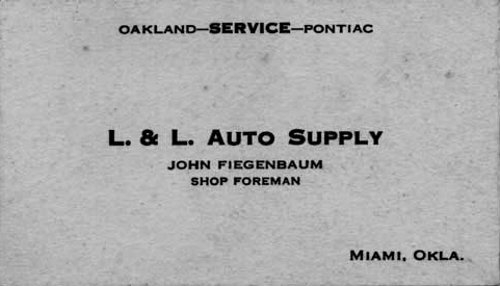 The business card below identifies John Fiegenbaum as the shop foreman at L & L Auto Supply.